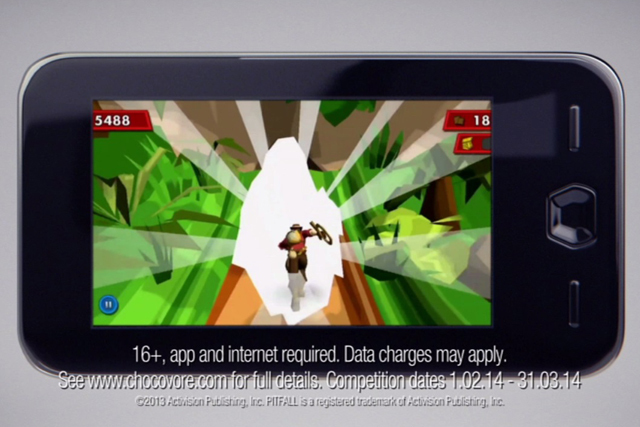 Kellogg's Krave cereal brand has created a free-to-play mobile game called Pitfall! that invites consumers to compete for the chance to take part in a real-world event, to be held in Malta and filmed by MTV. The campaign, dubbed the ‘Quest for the Chocovore Idol’, is being publicised via a 30-second TV spot created by Leo Burnett and running in the UK and another seven European markets. The ad shows a nugget of cereal being thrown into a "sacrificial" chocolate waterfall and emerging covered in confectionary, before being devoured by his fellows. Consumers can download the "free-running" game and compete across six levels. Four top-scoring players will then be given the chance to compete for a £10,000 prize in a real-world quest taking place in Malta, which will be broadcast by MTV. Isobar created all digital aspects of the creative, including producing a microsite and orchestrating social elements; while the game itself was developed in partnership with Activision Publishing. The overarching media strategy was devised by Carat, which also negotiated the deal with MTV. Consumers can download the game from iTunes, Google Play or Amazon stores. Laura Bryant, European brand manager at Kellogg’s Krave, said: "Mobile games have a great resonance among our key audience and are the perfect platform through which teens can directly experience the brand. "The 'Quest for the Chocovore Idol' campaign immerses teens in a virtual branded experience, which goes beyond the realm of the digital world and expands seamlessly into the real one. "This fully integrated campaign sees MTV, a key teen brand, become the nexus between the real and virtual world and reflects consumer insights on the most relevant channels to drive brand engagement and sales."